“Welcome to Versailles!” The awe-inspiring drama has finally made its way to us via Ovation TV. Versailles begins in France in 1667. You will be exploring the great world of King Louis XIV, played brilliantly by George Blagden. If you watched Vikings, you are well aware of the depth and range of this phenomenal actor. 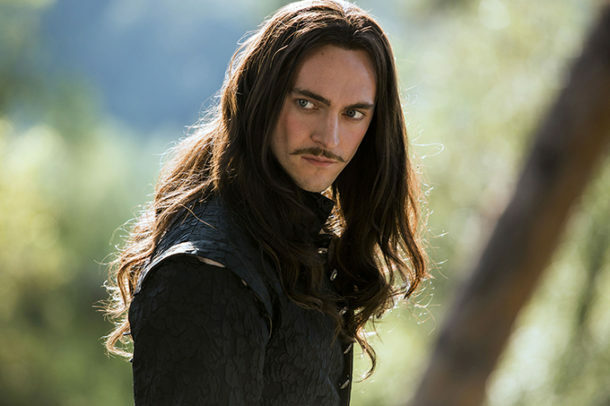 Athelstan broke your heart in Vikings, so I hope you’re ready for what King Louis XIV is going to do to your heart in Versailles. Versailles is the best of everything. Don’t miss the series premiere of Versailles, which airs Saturday night at 10/9c on Ovation TV. One of the most entertaining aspects of the series is the sibling rivalry between King Louis XIV and his brother Philippe (Alexander Vlahos). The beauty is in the backstory. They grew up together but under very different circumstances. King Louis XIV was never to be overshadowed. Philippe will instantly have you mesmerized, and you will gladly fall victim to his truths and scandals. Alexander Vlahos is amazingly talented. I’m ashamed that I’m not familiar with his work prior to this role. Chevalier (Evan Williams) is the troublemaker of the series. He’s the one that you are instantly going to want to smack. He has an insidious relationship with Henriette (Noemie Schmidt), Philippe’s wife. Queen Marie-Therese (Elisa Lasowski) doesn’t seem to fit in. She is expecting, but don’t worry the birthing bed is being prepared. After watching this scene you will be reminded of how wonderful medicine is today and that being a queen has its drawbacks. Let the clapping commence. Claudine (Lizzie Brochere) assists her father Dr. Masson (Peter Hudson). Lizzie Brochere should be a very familiar face, if you watch television at all. She was in the best seasons of American Horror Story, The Strain, and now she’s the star of Falling Water on USA Network. Claudine’s passion lies in something that was unacceptable for women to pursue. Lizzie is always brings so much to her characters. There are so many characters that you will meet in the first episode alone. I just wanted to throw a few of my favorites at you. I must also give a shout-out to the creepy clapper. Just wait, you will know him right away. This series gives you an all-access pass to the best and worst of humanity. Something that is very relevant today. The sets are lavish. I want all of the damask wallpaper. The costumes will take your breath away. All the layers and attention to detail add to the beauty of the period drama. The one thing that really needs to be addressed is the level of undress. I’m only speaking about the premiere, so perhaps it changes as the series progresses. You know, love scenes shouldn’t be one-sided. Where is Tom Hardy a la Bronson when you need him? Let’s level the playing field. In the words of King Louis XIV, “Take it off!” Sorry, George! I’m just all for equality. Some of the best shows pay attention to equality and it works in their favor. Versailles is a wonderful series that focuses on power, corruption, betrayal, family, and everything in between. 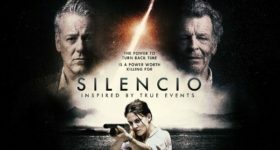 The acting is superb. You will instantly be left craving more episodes. Don’t miss the series premiere on Ovation TV. 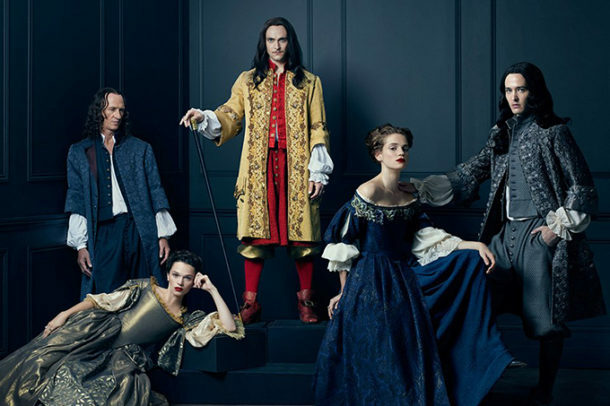 Versailles premieres Saturday, October 1 at 10/9c on Ovation TV.